Following closely on the back of a blistering pair of sets at Australia’s annual conference-come-festival BIGSOUND comes the debut single from Brisbane powerhouse, WAAX. Wisdom Teeth is as immediate as they come, clocking in at 2:10 and achieving so much – a massive chorus, an infectious call and response that won’t dissipate from your brain for ages and, most importantly, an introduction to an important new band. Front woman Marie De Vita has already been touted as “a revelation” and the accolades are beginning to stack up. Having only been released via the band’s triple j Unearthed page, Wisdom Teeth has now been released officially. The accolades keeping stacking up for Sydney’s psych trio The Walking Who. Just last week they were announced winners of FBi Radio’s coveted Northern Lights competition alongside rising solo talent LUCIANBLONKAMP. The competition will take them to Iceland in November to play Iceland Airwaves Festival with bands such as The Flaming Lips, Future Islands, The War On Drugs, Jungle and more. While they have been busy winning over new fans via the airwaves, they’ve also been cutting and pasting, quite literally, to bring you the video for their single, With Roses, the very track which won them a spot on an aeroplane to the northern hemisphere. Premiered by Rolling Stone Australia, “…the track’s video is an extensively detailed artwork, with its infinite level of detail obviously slaved over for countless hours…a natural flow that perfectly compliments the music’s own enthralling journey”. Toiled over by member of the band Jay with art direction by L.A. Early, the video will resonate with anyone who loves Monty Python-esque collage animation. The Walking Who are set to release even more music before 2014 is out. After penetrating airwaves and the blogosphere with their previous single Halfway There, Split Seconds is proud to announce the release of a brand new single, Delivery, from their upcoming EP release titled Neil Young & Dumb. The new track and EP is as you’d expect having experienced the band’s flawless back-catalogue to date – a natural progression for a band already with a penchant for penning perfect songs that emerge as feeling already classic. Herein lies unconventional and clever lyricism with sharp and textured arrangements. After pricking the ears and captivating genuine music lovers across the globe with Too Late For Love, the self-described “Rock Band Brisbane” Babganouj return with another slice of indie-pop gold called Bluff. Building beautifully in just under three minutes, it’s Harriette Pilbeam’s vocal taking the lead this time around, yearning sentimentally about love unrequited delivered with astonoshing restraint. Upon its first play, triple j’s Dom Alessio tweeted: “The film clip for this song really needs Winona Ryder & Ethan Hawke in it” nodding to the incredible 90s sound the band has managed to pull this time around. Charles used to play in Yves Klein Blue. Jack drummed for Inland Sea. Harriete and Ruby played for Go Violets. Babaganouj play almost-kitsch power pop in the vein of Australian classics like The Melniks and Smudge with inspiration from Creation Records and Flying Nun classics you’ve probably heard a few times before. The band’s first EP release Sife Lucks, produced by hometown hero Tim Steward of Screamfeeder, enjoyed radio and blogosphere attention with the band’s debut video for Love Loathe Love You similarly making rounds. 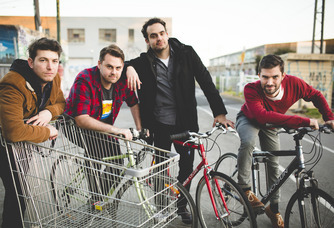 Their March 2014 single Too Late For Love was produced by Sean Cook (Big Scary/Jeremy Neale) and received widespread support as well as being added to full rotation on triple j. Their upcoming single Bluff is taken from their forthcoming EP due to be released in October 2014. Sydney based trio Tin Sparrow have been lying low for the past little while but after a shuffle in their lineup, a slew of writing trips and overseas holidays and a promise to themselves to go back to basics, they’re proud to announce the release of their new single, Echoes In The Dark. The single will feature on their third EP, Shoelace Ring, which was produced in a farmhouse in regional Victoria with Dann Hume and will be released in coming months. The track combines driving rhythms reminiscent of Arcade Fire circa The Suburbs mixed with a jangling guitar hook and front man Matt Amery’s soaring vocals – sounds that could be easily attributed to Real Estate or the recent War On Drugs release. As the title suggests, Echoes In The Dark taps into the notion of memory and the small pieces of someone that get left behind that, whether we like it or not, remind us of them. Tin Sparrow will be taking their new single to the road with three dates set down in Wollongong, Sydney and Melbourne to celebrate the release. 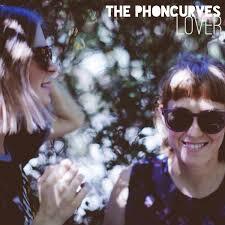 Beloved Brisbane duo The Phoncurves are back with new single Lover, a return to the signature, soulful foundations laid with their recent single, Heartstrings. The pair received lavish praise largely for their use of layered vocals as well as a modern take on a beautifully classic, alt-pop sound. Lover builds on all these growing band trademarks and showcases not only their stunning harmonies but also a rolling groove, captivating lyrics and wonderfully left of centre instrumentation.